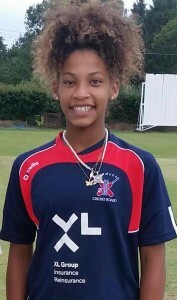 Bermuda’s Leilanni Nesbeth has been nominated to trial for the Sussex County Girls U15 squad next month. Leilanni will be assessed by the Sussex county coaches on several aspects of her cricketing ability, from batting, bowling, fielding, athleticism, how she responds to feedback, decision making and many other areas throughout the trials. In the last ten years, the Sussex Women’s team have won the County Championship six times, in 2003, 2004, 2005, 2008, 2010 and 2013. The Women have also reached the County T20 semi final in the last three years, winning the national final in 2012. In 2011 the Sussex age groups had a most successful season, with the Under 17s winning the County Championship, the Under 11s winning the Arundel Festival, the 13s were runners up in the County Championship final and the under 15s reached the semi final of the County Championship. Also Sussex had the most girls selected for the Junior Super 4s in 2011, which consists of the best 48 under-19 players. Sussex had 11 players selected for this. In 2012 the Seniors became T20 National Champions, the Under-17s London & East Region T20 Champions, the Under-15s were placed 6th in the County Championship and the Under-13s attained 3rd place. There are currently two Sussex players in the England set up – Georgia Elwiss and Sarah Taylor, Arran Brindle having retired from international cricket at the end of the 2013/14 Ashes series. Best wishes from everyone at CP Athletic Development, we miss you Leilanni! Keep up the good work.